Cuprite is an unusual mineral with several interesting properties. Gem quality specimens are rare and of great interest to collectors. By chemical composition, cuprite is a copper oxide that forms in the oxidized zone of copper sulphide deposits, along with native copper, chrysocolla, malachite and azurite. Most crystals of cuprite are too small to cut as faceted gemstones, but some rare large gem-quality crystals have been found in Namibia. These unusual and striking gems are extremely rare. Cuprite is sometimes known as red copper for its distinctive red color. The most typical color for cuprite is carmine, a deep red with a slight purplish tinge. Cuprite tends to be translucent rather than transparent, and some specimens are such a dark red that they can appear almost black in some lighting. But as you can see in our video, when illuminated with a bright light a gem cuprite will glow a vivid red. Gemologically, cuprite forms in cubic or octahedral crystals, and it is one of a small number of singly refractive gems (along with diamond, spinel and garnet). But cuprite is quite soft, with a hardness rating on the Mohs scale of 3.5 to 4, in the same range as fluorite, sphalerite and rhodochrosite. Due to its softness, cuprite is notoriously difficult to cut and polish. Though it is possible to achieve a nearly mirror-like luster, close examination of the surface will reveal tiny pits which are typical of polished cuprite. Cuprite has a exceptionally high refractive index of 2.849, higher even than diamond (2.417 - 2.419). Though most gems with high refractive indices are the harder gems -- such as diamond, corundum, demantoid garnet and zircon -- there are some softer gems like cuprite, sphalerite and sphene that also rank high. Cuprite also has superior luster, graded as admantine or submetallic. Cuprite has another fascinating property -- it is extraordinarily dense, with a specific gravity of 5.85 to 6.15. 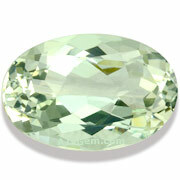 To put this in perspective, colored gems which are denser than diamond (3.50 to 3.53) are always notable. The most famous ones are ruby and sapphire with a density of 3.95 to 4.03 and zircon with a density of 3.93 to 4.73. But cuprite is in a different class all together, with a density 75% higher than diamond! Virtually all of the gem-quality cuprite in facetable sizes came from a single unique deposit in a copper mine in Onganja, Namibia. The largest crystals of cuprite in the world, up to 14 cm in diameter and 2.1 kg in weight, came from this mine. These crystals were typically coated with a thin layer of malachite and were discovered in 1973. Crystals measuring 6-8 cm, not as large as the record-size specimens, but nevertheless enormous for the species, were not uncommon. Virtually every faceted cuprite gemstone over one carat in weight is from this same deposit. Since the mine is now depleted, fine cuprite specimens are sought after by collectors. This month we feature rare gem varieties from our collection. A very rare gem-quality cuprite over 20 carats! In a deep carmine red, this unique gem came from the famous deposit in Onganja, Namibia. These fine cuprites have considerable translucency and display a vivid red when backlit, as you can see in our video. A rare specimen for the collector. Guaranteed natural and untreated. A fine Demantoid Garnet from the classic location in Bobrovka, Russia. 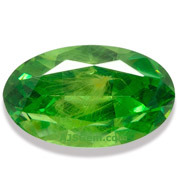 This is a very bright gem with a medium green color. This stone displays a well-formed horsetail inclusion which is the hallmark of the rare Russian demantoid. Guaranteed natural and untreated. Yellow is one of the rarest of all tourmaline colors, with colors ranging from canary to gold, usually with just a touch of green. 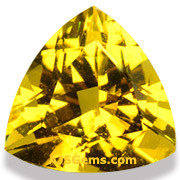 Most yellow tourmaline have significant inclusions. But the vivid color and excellent brilliance make this a popular gem with collectors of rare stones. This trillion is notable for its pure yellow hue and good clarity. Guaranteed natural and untreated. Oligoclase belongs to the plagioclase feldspar family of minerals, which includes sunstone and labradorite. Transparent specimens of oligoclase are rare. Sometimes this material is incorrectly described as transparent amazonite. Oligoclase has a hardness of 6-6.5 on the Mohs scale. 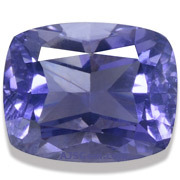 A bright and very clean gem iolite in the lighter violet color. Fine cutting brings out the sparkle in this excellent material. Guaranteed natural and untreated. 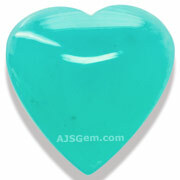 A beautiful large gem silica in a hard-to-find heart shape. Sourced from the famed Inspiration Mine in Arizona, this fine specimen displays a soft turquoise color with good color consistency and translucency. This will make a gorgeous pendant for someone special. Guranteed natural and untreated. A heart-shape fancy red diamond ring by Moussaieff set a world auction record at Christie’s Hong Kong auction in November. The 2.09 ct. diamond ring sold for $5,095,872 ($2.44 million per carat) to a private Asian investor. The pre-auction estimate was $3.5 to $4.8 million. Gemfields Plc held their second auction of rough ruby from the Montepuez deposit in Mozambique. The sale was 74 percent sold, with revenue of $43.3 million. 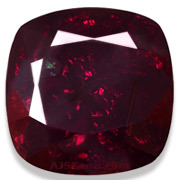 This sale featured only untreated, higher-quality ruby, including a 40.23 ct rough ruby. Gemfields says that 50 companies bid on the ruby lots, with attendees from Austria, China, Germany, India, Israel, Japan, Sri Lanka, Thailand, the UK and the USA. Actually we don't have a retail store with display cases full of gems. But we do show gems by appointment at our office in the Bangkok gems district. We are open Monday to Friday, 9 am to 6 pm. If you would like to view gems at our office, please email us for an appointment. We will be in Tucson again this year, exhibiting at the Pueblo Gem & Mineral Show at the Riverpark Inn from January 30th to February 11th. The show hours are 10 am to 6:30 pm daily. You'll find us in room 148. We'll be showing a large selection of rough stone as well as cut and polished gems. We look forward to seeing you there.